I know I’m cray-cray, here. 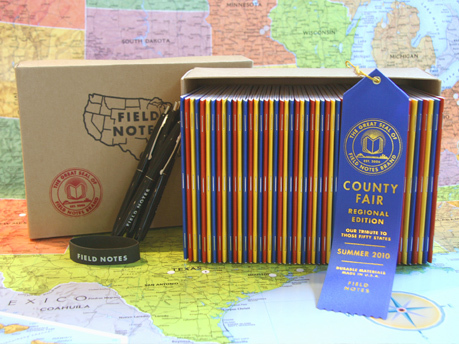 This morning, while looking at the Field Notes site, oogling all the little notebooks that inspire a strong urge to go draw and, of course, fill up little notebooks — I saw that they have a boxed set of all fifty states’ County Fair notebooks from 2010, which I’ve coveted with a strong and abiding desire since their release. And out of the blue, the little sparky lightbulb started burning in my brainmeats, and I seriously thought to myself: y’know…it’d be really fun to visit county fairs in each one of the states, and record it all in each state’s notebook. Like a collection of experiences instead of just stuff, and a goal to reach for and all that. Plus, how much fun would it be to see a county fair in Arizona, or in Maine? All the places I’ve never been. I could take pictures and stick them in…or better, draw the places….and do little interviews and QR code them so I could access them later…. And then sanity left my body completely and I was left babbling and drooling under the desk, sure in the knowledge that I don’t have enough spare cash to convince my family that eating ramen noodles is worth this box of goodness I just bought, or that family vacations should be to county fairs all over creation for the forseeable future….but wanting to, dangit. Wanting to, hard. Anyway, the notebooks are awesome. You should buy some so I can live vicariously through you. Next post: Meditation? Journey? CTFD?